Learn how to download Geometry Dash for PC! Geometry Dash is an action-packed platformer. This fast-paced game tests your response and skill at the same time. You can play Geometry Dash online or enjoy the game on your mobile phone. You can also download Geometry Dash for PC and play it on your laptop. This guide explains how to download the full game for your PC using various simple methods. 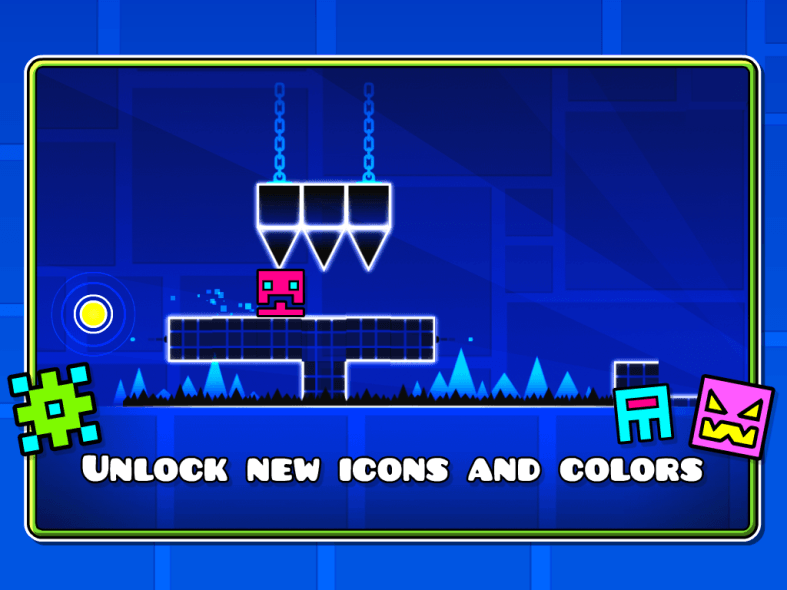 Geometry Dash 2.2 uses simple tapping and clicking system to allow the player to control various vehicles. The basic vehicle is a cube but you can unlock and buy other vehicles once you have collected enough coins. Obstacles are cute geometrical shapes such as cubes, rectangles, and triangles. The objective of the game is to reach the end of each level without crashing into an obstacle. You can jump or roll over the obstacles. In the full version Geometry Dash 2.2, you have all levels unlocked by default. Before you download Geometry Dash 2.2, let’s have a look at some of the best features of this game. This game is a high-octane side-scrolling game that requires good timing and skill to beat the levels. You can play this insanely addictive game on PC, Android phone, iPhone, and Windows phone. However, we will only discuss how to play Geometry Dash on PC in this guide. This game has million downloads on iTunes and Google Play store. However, if you don’t have a mobile phone, you can still enjoy this beautiful game on your computer. It’s available for PC via Steam client. Playing this game on PC is more fun compared to playing it on a smaller screen (mobile device). You can also attach a dedicated controller to your PC to improve the controls. Similarly, you can easily see even the smallest obstacles and avoid them. That means you can score big when playing it on a computer. Once you have installed this game on your PC, you will enjoy highly challenging and intense gameplay in this extremely addictive game. Below, you will explore two simple methods to enjoy your favorite platformer action game on PC. To play it on PC, simply install Steam on your PC. Once installed, you can purchase the game on the Steam store. Your system needs to meet these minimum hardware/software requirements to run Geometry Dash for PC. Steam is a gaming service that brings many popular titles to PC owners. Once you have installed Steam client, you can purchase your favorite games from Steam Store and play them on your computer. Alternatively, you can install a game from a CD and activate it in Steam to enjoy its community features. Geometry Dash Online is available on Steam. If you are not sure how to install the Geometry Dash 2.2 using the Steam client, then follow the simple steps below. Steam can be installed on Windows, Mac, and Linux. That means you can play Geometry Dash and other popular games no matter which OS you are using on your computer. Geometry Dash for PC costs $3.99 on Steam. But you can also play it free on your PC by using Geometry Dash apk. Alternatively, you can install the full game from Play store for $1.99 and enjoy it on your PC. You will learn it all in the second method explained below. If you don’t want to spend $3.99 on Steam to play this game, you have two other options. To use any of the above-mentioned options to enjoy your favorite game on a bigger screen, follow the simple instructions below. NOTE: Before you proceed, it’s important to know that you will run Geometry Dash for PC using Bluestacks Android emulator with this method. An Android emulator allows you to run Android apps on your PC running Windows or iOS. Now follow the steps below and start playing this highly-addictive game. How to beat your friends at Geometry Dash Online? Geometry Dash for PC is a lot of fun since you use keyboard/controller instead of touch controls. The game becomes incredibly easier to play. It also means you can beat your friends and show your high score to everyone. Below, find some additional tips and become a pro at beating everyone else in this fast-paced game. One of the biggest advantages of playing this game on PC is that you get a choice to select your favorite controller. You can set your mouse as your preferred controller or opt to use your keyboard arrow keys to play the game. For a majority of players, mouse works the best. You will need to left-click on the mouse to jump. Alternatively, you can use the keyboard and set ‘space’ key or ‘up’ arrow key to jump. If you are on a laptop, mouse button could be a very good option. For desktop users, ‘space’ key on keyboard works like a charm. That’s it. You should be able to enjoy your favorite action-packed platformer on the bigger PC screen. Geometry Dash 2.2 is a lot of fun so be sure to share your high score with your friends.